Environmental education is becoming vital to today's society. The conservation of our natural resources is in the hands of future generations, so we must start teaching now! 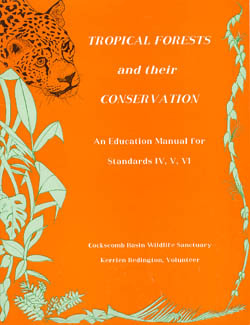 This manual combines the ideas of conservation with a basic scientific background. It provides a text to be used by children (Standards IV, V and IV) that will explain what a tropical forest is, how it works and why it is important. To teach local children the importance of the tropical forest and its conservation. To give children a basic understanding of some of the scientific principals behind tropical forest ecology. To show the inter-relationships and the importance of maintaining intact ecosystems. To dispel fears and apprehension about the forest. To enhance problem solving skills and to encourage students to think about the problems related to the forest and its use. To suggest activities which will enhance learning and enjoyment of the subject. The information is presented in simple language so that children can use the manual directly. All technical terms are printed in bold type and explained in the glossary. Each section covers a new topic. These are best studied consecutively, but can be taken one, or several at a time depending on the time available. The AIM of each section is shown in a box at the start. Class and individual activities are suggested throughout the manual. These can be used to consolidate or build on information in the text either orally or as written work. The REVIEW QUESTIONS at the end of each section can be used to ascertain whether the objectives have been reached. This manual should provide a simple, concise introduction to the basic science and conservation issues of the tropical forests. It is designed to be fun, with as much practical participation from the children as possible. Enjoyment leads to learning! Cockscomb Basin Wildlife Sanctuary is used as an example of a tropical forest. Here there are opportunities for classes of school children to visit the tropical forest and experience it for themselves with the guidance of wardens. There is an interpretive center and several trails suitable for further practical environmental education activities. Seeing is believing!